With Wimbledon underway and the World Cup motoring along nicely (despite England somehow managing to get knocked out in the first week), it can only mean one thing - game fair season is upon us. 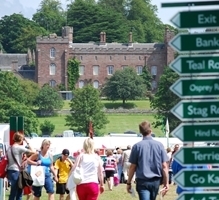 The 26th GWCT Scottish Game Fair at Scone Palace takes place between 4-6th July and offers something for all the family. New headline events for 2014 include The Welsh Axemen who will don razor sharp axes and compete against each other in a tree felling simulation in the main ring arena with a terrifying tree climb finale you won’t want to miss! Over 300 exhibitors will be at the Scottish Game Fair including some of Scotland’s top food and drink producers and a wealth of equipment and clothing shops. For more details of what's on at the fair click here. The CLA Game Fair takes place two weeks later at Blenheim Palace between 18-20th July. As always our stand will feature fascinating displays and demonstrations, informative talks and fabulous food and drink. Mike Clarke, CEO RSPB, will be giving a presentation on conservation on shooting estates at 5pm on Friday 18th July in our Member’s Area and it will also be Happy Hour on our stand – join us for a Woodcock-tail! The talks on our stand will cover subjects ranging from modern predator control, fishing, woodcock, improving shoot performance and the great conservation work undertaken by farmers. In the meantime make sure you download your FREE voucher to get £2.50 off a full English breakfast at our stand. We look forward to seeing you there!